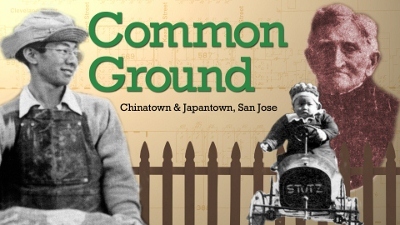 This September, guest curators Connie Young Yu and Leslie Masunaga will unveil a special exhibit, “Common Ground: Chinatown and Japantown, San Jose,” at JAMsj that focuses on the story of Heinlenville, San Jose’s last Chinatown. Yu is the author of Chinatown, San Jose, USA, now in its fourth edition. The new JAMsj exhibit will focus on the personal story behind Heinlenville’s residents and chronicle that community’s relationship to and influence on current-day Japantown. The exhibit will feature artifacts from a 2008 Sonoma State University archaeological excavation of the Heinlenville site. Included in the collection are personal mementos of the curators, including a check made out by Masunaga’s grandfather to the Tuck Wo store, and objects from Yu’s family. There will also be a video associated with the exhibit that incorporates photos and interviews. The construction of San Jose’s last Chinatown began in 1887, several months after arson destroyed the Market Street Chinatown. Heinlenville was bordered by Fifth, Seventh, Jackson, and Taylor streets. It was established at a time of great anti-Asian sentiment, amid calls by city leaders and citizens for the complete elimination of Chinese settlements within the city’s perimeters. Heinlenville was originally surrounded by an eight-foot high fence covered with barbed wire to protect the Chinese from anti-Chinese elements. The namesake of the town is John Heinlen, a German American immigrant and businessman who defied convention in the 1880s by agreeing to lease land to the Chinese and Japanese in San Jose. His defiant actions, made during a time when strong nativist passions were also rampant, still resonate with us today. “There’s something tangible, in having something to touch and see,” says Masunaga about the artifacts. “It’s something that connects to you as opposed to seeing something in a book, or on paper, or something that just becomes very academic and very cold.” Tangible items, such as boar’s teeth, marbles, and jade bracelets, in conjunction with photographs and anecdotes, help to elucidate the daily life of Heinlenville. This combination also illuminates the quiet dignity of citizens, in the face of outside hostility. Both curators have deep roots in the Bay Area and have worked extensively together as a team. The two first met in 1990 when Masunaga was working as an archivist at the San Jose Historical Museum, and Yu was working on the book, Chinatown, San Jose, USA. This entry was posted in Events, Feature Articles and tagged Chinatown, Connie Young Yu, Heinlenville, Japanese American Museum of San Jose, Leslie Masunaga. Bookmark the permalink. who weave their own insights and personal stories into their projects so I anticipate a very engaging and entertaining exhibit.